For millennia, people have given their children toys to help them learn about the world around them. The toys children play with demonstrate how cultures from around the world can be both different and exactly the same. When the early colonists arrived in Australia, they found that Aboriginal children were playing games and using toys that were similar to those from Europe. Find out about physics and toys, the importance of safety, toys and business and how toys have changed over time. 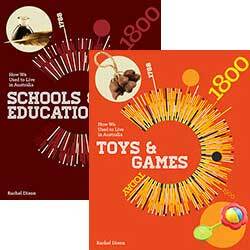 Included are descriptions of colonial games and traditional Indigenous games, as well as a look at where toys in Australia come from now. The style of living we take for granted in Australia today was very different in the past. Many everyday tasks involved using tools and implements that are unrecognisable in our modern world. The Australian Aboriginal history of daily life, as well as that of the first colonists, all provide intriguing stories of how we all used to live and how we gradually moved on to depending on gadgets, fast food and other modern ways of life that our ancestors from the past would find amazing.